Located at the The UK’s Biggest Free Action Sports Festival, Windfest on Sandbanks Beach in Poole. Both the festival and competitions are totally free to enter all weekend. We will be set up for Demos and Jam sessions all weekend – 10th & 11th September. Prelims on Saturday morning then the comp will be held on Saturday afternoon. Limited camping is available to entrants (£15 pitch), let us know if need more details. This must be pre-booked. Whatever your age or ability, there will be an opportunity for you to join in & have a go. National Slackline Champs, open to all UK Slackliners. Windfest 2011 is shaping up to be an amazing festival with loads of attractions and competitions. We’ll have a Free Play areawhere anyone can come and have a go on a slackline – we’ll be on hand to help you get started andto progress. 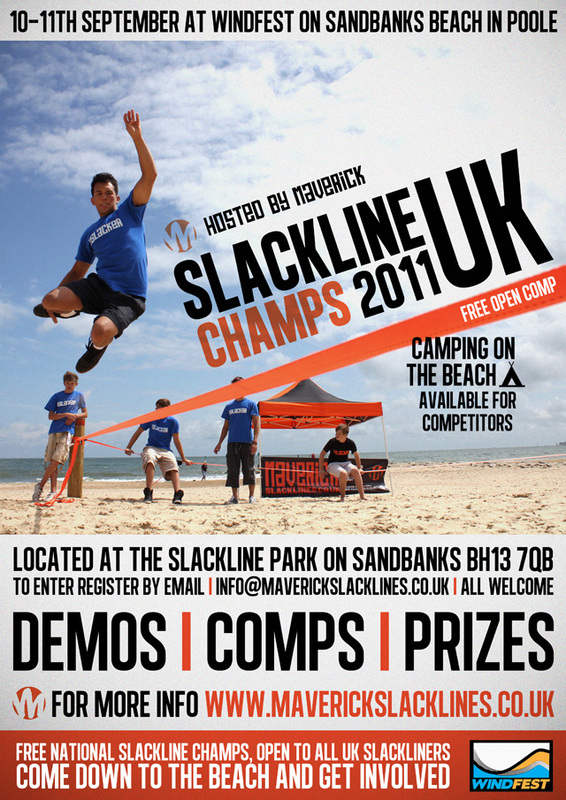 Demos by the Team Riders and the First Annual UK Slackline Champs, taking place on Saturday 10th September 2011. (Heats will begin at 2pm and the final will take place at 5pm, please see below for the competition rules and competition line spec). Whether you’re entering the Comp or not, come down and get involved, this is going to be an incredible weekend! i. The winner of each Heat will be decided by majority vote. iii.If a Slacker put a foot flat on the floor or they fall off, the other competitor steps up. iv. Once the time limit has expired a claxon will sound and the Slackerhas to step down. Any tricks after the Claxon has sounded do not count. ii. 14 meters long (walk-able distance, A-frames will be used). Please provide your full name, age, home address and a contact number. – preferable mobile.